The property has a very nice flat terrain which is great for outdoor games and entry into lake. It has a natural beach cove. Great view of one of few Islands in Finger Lakes region, approximately half mile from shore. View of Marina at Union Springs looking out from natural peninsula point and private permanent dock. Fire pit right on shore. Easy walk to village, grocery store and village park. Some of best Bass fishing in finger lakes region. (Pro Bass shop within 7 miles in Auburn Area). Included in cottage rental is use of kayak, stand up paddle board, pedal boat, and row boat. There is golf, tennis courts, basketball courts, boat rentals, paddle boards rentals, and kayak rentals near by as well as what is supplied with the cottage. There is a double bed, 3 twin beds and a twin bunk bed. Supply your own linens (bedding, bath towels and kitchen towels). The village within walking distance with in a half mile offers two pizza places, a restaurant, Post Office, Marina, bakery shop, grocery store, a laundry mat. Village Beach and boat launch. 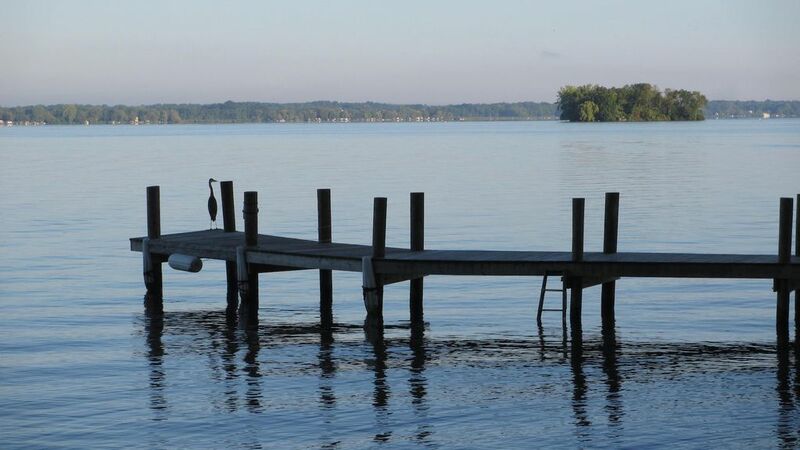 About 100 plus feet of lake front, with easy entry into the water as well as a permanent dock for fishing, boating, swimming off or just putting a chair out there and sun bathe on. It has a fire pit to watch sunsets and roasting marshmallows. A great place to gather around and story tell or just enjoy the warmth of the fire. Beautiful property and clean. Great views. Glad you all enjoyed the stay. We feel it is a special place. Thanks for your stay! Great stay! Fred was very accommodating. Quiet and peaceful. Would love to book again. Would book again! Fred was quick to respond to questions and provided suggestions for things to do. The cottage provided a relaxing atmosphere. A terrific getaway destination with an exceptional view of the lake. Be sure to check out Poppy G Restaurant 2 minutes down the road! Fred's cottage was perfect for a long weekend. It has everything you need to relax including a wall of windows to watch the sunset and take in the lake. Loved the paddle boat, kayak and SUP that were included in the rental. The kitchen has everything you need, propane grill which appears brand new, and indoor and outdoor tables. Large lawn for outdoor games. The best thing though is watching the sunset. Beautiful fire sky with picture perfect views. Fred was so quick to respond with any questions and communication, arrival and departure were a breeze. Thanks for sharing the cottage with us! Will come back! The Village of Aurora is a beautiful area that offers a golf course and dinning. I like the Fargo Bar & Grill, also fine dining at the Aurora Inn and a favorite is Pumpkin Hill Vineyard a few miles out of town going south on Rt 90. A must see is Montezuma National Wildlife Refuge the home of many eagles.It is located north on 90 to Rt 20 go left and across the bridge it is on the left side of the road 9.5 miles away. Two winery's close by are Heart and Hands Winery south on 90 1.5miles on your left. The other is the Apple Station Winery go north on 90, then right on 326 and take your first left about 2.7 miles. Two nice winery's out side of Aurora going South on 90 Lone Point Winery, and Treleaven Winery you can google then for exact directions. Also a large wine trail on Rt 89 on the West side of the lake.